When SG-1 arrives on Cartago, Teal'c recognizes the planet as home to the Byrsa, a planet the Goa'uld often visit to harvest human hosts. Teal'c is recognized too, by Hanno, a young man who claims Teal'c killed his father years before. 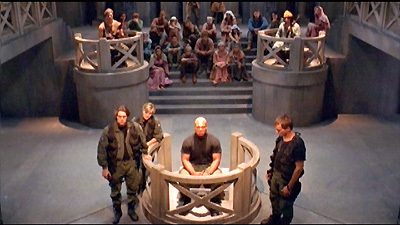 Hanno demands cor-ai, the Byrsa system of justice, but with Teal'c's confession, the trial quickly finds him guilty and sentenced to death. As Teal'c accepts his fate, SG-1 launches a vigorous defense. But it is during a Goa'uld attack that Teal'c's actions prove he is a changed man, and Hanno is persuaded to overturn his decision. Teal'c visited Cartago before to harvest human hosts, and killed Hanno's father under orders from Apophis. Cor-ai: local custom of justice determined by the person wronged. Circ Kakona: local name for the stargate with both Latin and Greek origins meaning "Circle of Woes." Pecca-ve: local custom of taking a confession, from the Latin meaning "I have sinned." Shak'l, leading the force of Serpent Guards, was killed by Teal'c.